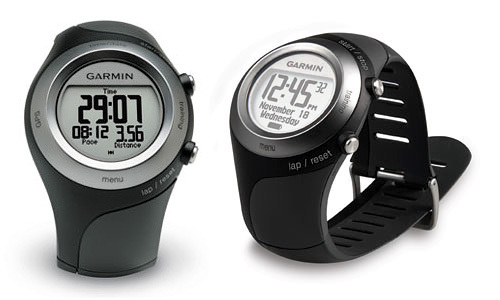 Garmin Forerunner 405 Brings GPS Watches Down To A Reasonable Size | OhGizmo! CES 2008: What Do You Want To See? While being marvels of electronic engineering, the first GPS equipped watches were ridiculously large units that were as good at being wrist weights as they were at pinpointing your location. But it was inevitable that the technology would eventually shrink to the point where a GPS watch looked no different than a regular one, and I believe the Forerunner 405 from Garmin has reached that point. The watch is part of Garmin’s fitness line so it’s catered towards runners and other athletes who like to keep track of their performances while on the go. So instead of small hard to find buttons, the watch has a touch-sensitive bezel that can be used to scroll through menus and select options. The watch can also constantly monitor your time, distance, pace, burned calories and even heart rate when a coupled with a chest monitor. And that info can be wirelessly transferred to your PC or even another watch if you’re competing with a friend. The watch is part of Garmin’s fitness line so it’s catered towards runners and other athletes who like to keep track of their performances while on the go.